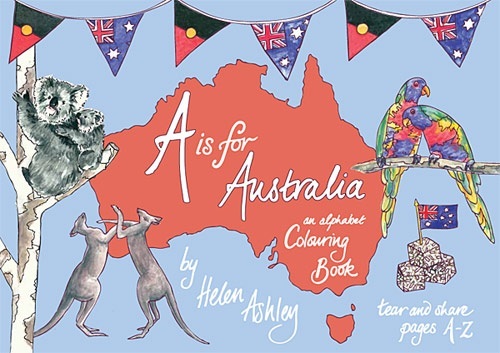 A is for Australia is an alphabet colouring book with each letter a page of iconic imagery of Australia. All original artwork by Helen Ashley. Each page has a perforated line for easy tear and share colouring. A4 landscape on great quality paper printed here in Australia. Also available from upmarket independent toy shops and book stores. Perfect for boys or Girls from 5 - 10 years old. Drawings with a sense of humour...... Lorikeets eating lamingtons, Numbats and Ned Kelly. Great postable gift. Perfect size for the aeroplane pull down tables. Screen free play time. Posted in: Creative educational colouring for kids,Made in Australia,Original gift or souvenir.